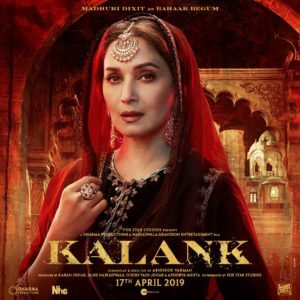 Madhuri Dixit will be playing Bahaar Begum in the upcoming movie “Kalank”, she shared the new poster of the movie and described Bahaar Begum’s character as “mysterious and enchanting”, she added that she is feeling blessed by getting the chance of playing the role. Kalank is a movie that is directed by Abhishek Varman and is being produced by Karan Johar. The movie stars Alia Bhatt, Varun Dhawan, Sonakshi Sinha, Sanjay Dutt, Kriti Sanon, Kiara Advani, and Aditya Roy Kapur. Kalank is set to hit the cinemas on 17th April 2019.